A fantastic opportunity particularly if you are travelling solo, for experiences usually only possible when travelling on a private tour for 2 on our Jaguars and Waterfalls. Travelling with a small group, you'll have incredible opportunities to see jaguars in the wild as detailed in this article with expert locals who work with Panthera. You'll also experience the Pantanal. Then it's onto the world-famous waterfalls, Iguaçu, to explore both the Brazilian and Argentinian sides of this 2.7km stretch of 275 waterfalls. At almost twice the width of Zimbawe's Victoria Falls and half the height again of Niagra, Iguaçu is a true world wonder. There is also an optional extension to Rio de Janeiro. Don't just take our word for it – Tell Tale trips to the Pantanal are Number 8 in Wanderlust magazine's "Top 50 Trips". No Single Supplement (which is not conditional on sharing a room throughout – you'll have your own room except for 3 nights at the jaguar camp). Fly overnight from London Heathrow on a direct flight to Sao Paulo with British Airways. We can add connecting flights from UK regional airports and Jersey at low or possibly no cost, ask us for details. It is also possible to upgrade your international flights to premium economy or business class. Morning landing in Sao Paulo and connect to our onward flight to the Pantanal. This flight will take just under 1.5 hours. Land in the city of Cuiabá in the late morning and have a short transfer to the hotel. Time to relax and unwind from the journey. Later on, a welcome dinner at one of Cuiabá's restaurants. We'll be picked up at the hotel by our wildlife guide and we'll head into the Pantanal. We'll be driving for a while on the bumpy Transpanteineira but it's more like a safari than a transfer. We'll see plenty of wildlife, capybara crossing the road and metre-long parrots and birds of prey flying overhead. We'll arrive at a fazenda (ranch house). Time to settle in or explore the ranch, great wildlife-watching opportunities. Dinner at the ranch with the sounds of the jungle as our backdrop before a night safari. If you see red eyes glowing in the dark, it's just the caiman. This morning, we'll have a walking safari. The area is famous for lakes filled with caiman, huge flocks of parakeets and Marsh deer (they uniquely have webbed feet). After dinner, we'll have a night safari. Morning walking safari at the ranch. 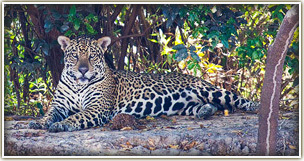 Then time to pack up and we're heading further into the Pantanal to a 'jaguar camp'. There is nowhere in the Americas where you will see more wild animals and this part of the Pantanal has the highest density of jaguars in the world. Don't expect luxury in such a remote area of Brazil, and we have to be on twin share here (3 nights of entire tour), but it is comfortable enough with ensuite facilities and air conditioning (there is electricity, though of course on a generator). Staying here will give us the very best chance to spot jaguar (100% sightings across all Tell Tale trips in 2014, 2015, 2016 and 2017). We'll have lunch then spend the rest of the afternoon on a boat trip looking for jaguar and river otters. River otters can be as big as a man. An early start for a full day boat trip and safari. Fingers crossed for jaguar and Tell Tale favourites capybaras (giant guinea pigs) and black howler monkeys. Have a look at these great photos taken by Tell Tale Traveller, Gary Baxter. Boat trip up the river to a more remote area. Time to pack up then we're back onto the Transpanteneira to drive to a fazenda (ranch house). This is larger/more comfortable than the previous one so you can relax by the pool if you want to opt out of this afternoon's walking safari around the forest. After dinner, we'll have a night safari. Fish on a Friday? 'Little' Giant River Otters in the Pantanal. If you're watching Planet Earth on BBC Earth at the moment, you know whom to call! (Tell Tale Travel :-)) Thanks to Julia Bond for sharing her video. Footage of Giant River Otters, taken on this trip by Julia Bond. Early morning start. We'll explore the lake by canoe, a great opportunity of the bird lovers. Then we'll go horse riding for a flavour of life in the Pantanal. Panteneiro cowboys are descendants of Portuguese who mingled with Brazil's native Indians and live their lives in a 200-year tradition. There will also be a walking option! Then we'll drive back to Cuiabá. Fly to Foz do Iguaçu, transfer to hotel and time to dip in the pool, relax or wander around town. Evening – option to join dinner at a restaurant in Foz do Iguaçu. Our guide in Iguaçu will take to the Argentinian side of the falls, which is set in deep jungle so it's great for wildlife spotting. When we arrive we'll take a train to the Devil's Throat, where the river thunders over the horse-shoe shaped precipice and down on to the rocks 74m below. Look out for the great dusky swifts, which dart in and out of the cascades – one of our favourite sights. Evening – option to join dinner. Our guide in Iguaçu will take us to the Brazilian side of the falls. We'll take in the panoramic view and then venture across the walkway that feels like it's right on the very edge of the falls. We'll also visit the aviary while we're here (one of our personal favourites), home to lots of tropical birds including some nearly extinct ones. Evening – option to join dinner. Breakfast and pack up or have a dip in the pool. Transfer to Iguaçu airport and fly to Sao Paulo, connecting to a flight with British Airways, direct to London Heathrow. Arrival back at London Heathrow. Breakfast and pack up. Transfer to Iguacu airport and fly to Rio de Janeiro. Transfer to hotel in a beach area of Rio de Janeiro. Time to settle in and relax by the pool or walk to the beach. Evening - option to join dinner at restaurant. Day sightseeing in Rio de Janeiro including the world-famous Christ the Redeemer by funicular railway, Sugar Loaf mountain by cable car and Atlantic rainforest. This evening, you'll be driven to a special fair which celebrates the culture and vibrancy of north Eastern Brazil, with food, stalls and music. Half day visit to botanical gardens with its giant Amazonian lilies and tropical plants and marmosets in the trees. Half day at leisure e.g. to relax by the pool or visit the beach Transfer to Rio de Janeiro airport to check in for your overnight flight with British Airways, direct to London Heathrow. 17 October 2020 - £4,425 per person including all flights Reserve with deposit - £200. No surcharges guarantee. It's also possible to book excluding international flights for £3,525. Flights between Cuiaba and Iguaçu will be included. You will need to make arrangements to meet the group in Cuiaba and your tour will end in Iguaçu. Add on flights from UK regional airports and Jersey – ask us for details. Rio Extension – £600 – accommodation in private rooms for 2 nights, transfers, guiding. Rio extension excludes entrance fees (in case you decide not to do these on the ground). If you're booking including flights, your flight from Iguaçu to Rio de Janeiro will be included in the price, if you're booking excluding flights, this flight will need to be arranged separately. Jaguar Mother and Cubs, Anteater, Pantaneiro 'Cowboy' and Jabiru Stork by Fred Barrington; Hawk by Marjorie Socha; Jaguar and Red-Billed Cardinals by Clare Maletroit; Iguaçu Falls by Hannah Wilson; Rio Landscape by Julia Bond.